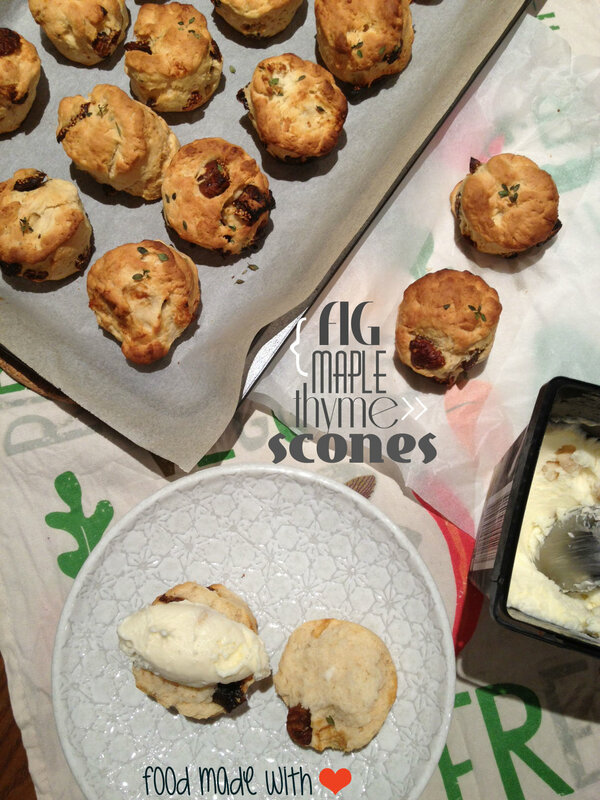 Okie, back to the scones! (: My love for scones come from my mum, we would make scones whenever we have time on our hands and have it immediately for tea. Instant gratification! haha One of our favourite places to have scones is at Ms Marples Tea Room up at Mount Dandenong! Although some might say theirs is more like a dense cake, mum must have it every time she comes to Melbourne! 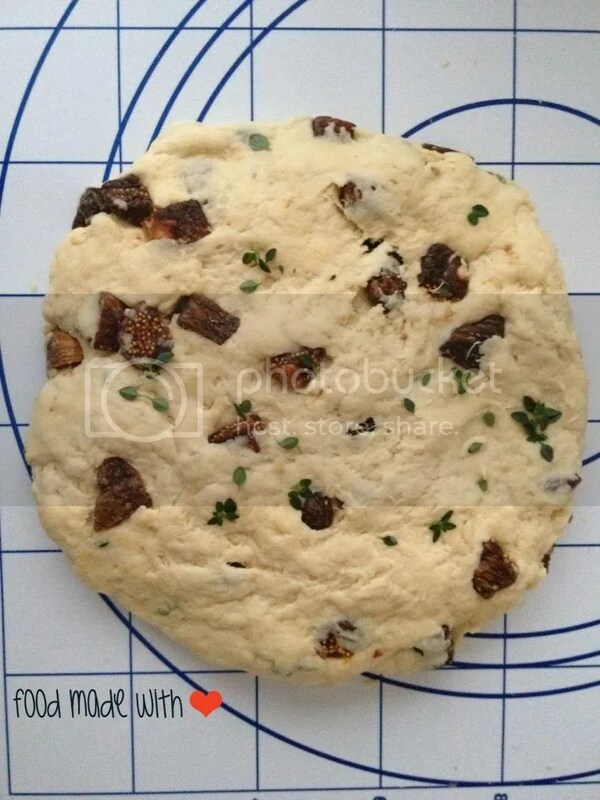 hehe I was going through Tastespotting and chanced upon a recipe that instantly caught my attention. 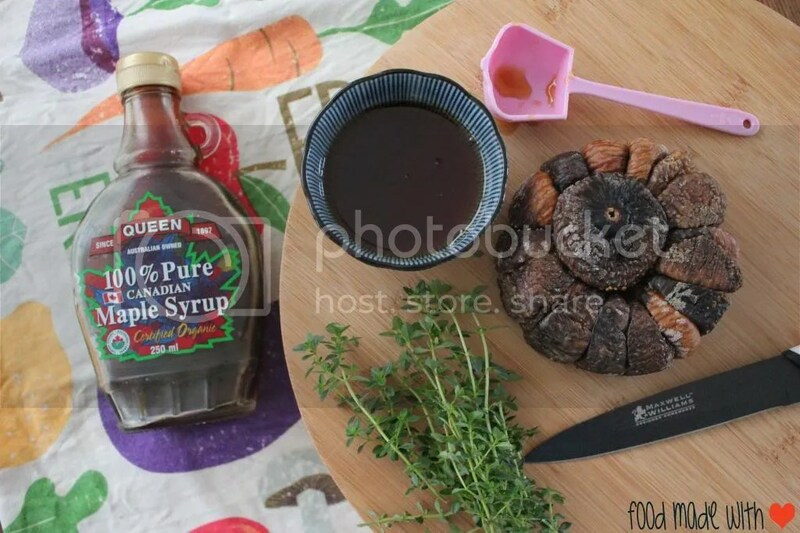 I made a variation of the recipe with the things I have in my pantry. These were SO GOOD. They were light and fluffy in the middle and just went so well with butter. I could have it for breakfast, tea and dessert! Definitely something I would make frequently now, plus it didn’t take much time at all! I know there are many different ways to enjoy a scone, but my favourite way is with butter and jam. 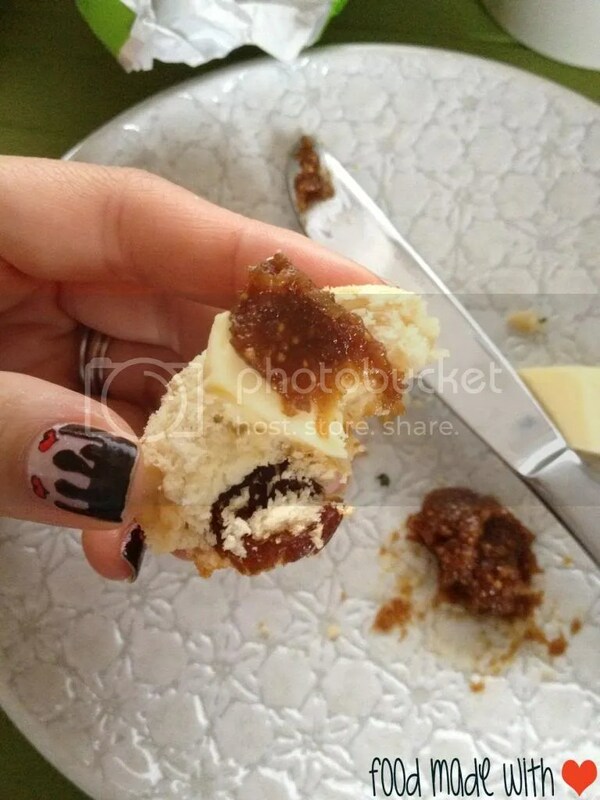 As I made fig jam a while back (recipe in the next post, so stay tuned cause it’s addictive! 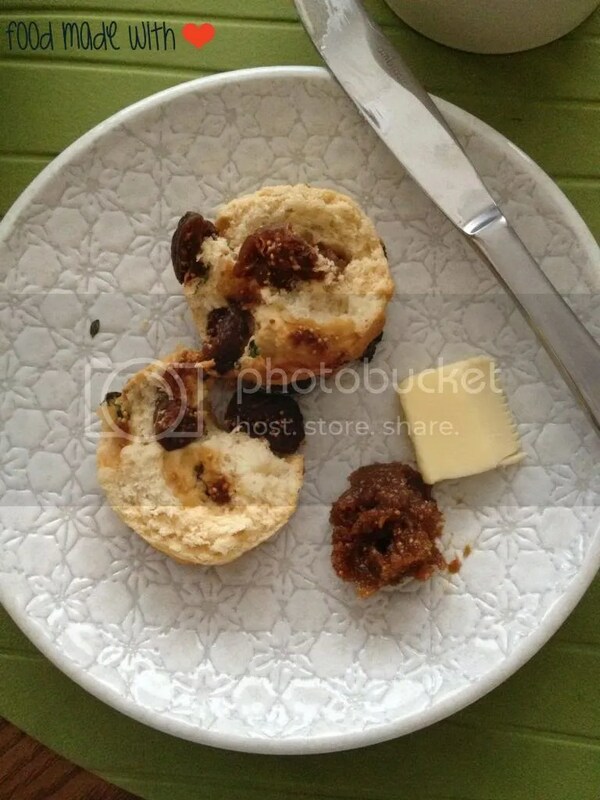 ), I had my warm scone with some unsalted butter and homemade fig jam! YUMMO! As a dessert, I topped the scones with a quenel of macadamia ice cream and it was delicious too! 1) Preheat the oven to 200 degrees Celcius and lined a baking tray with baking paper. 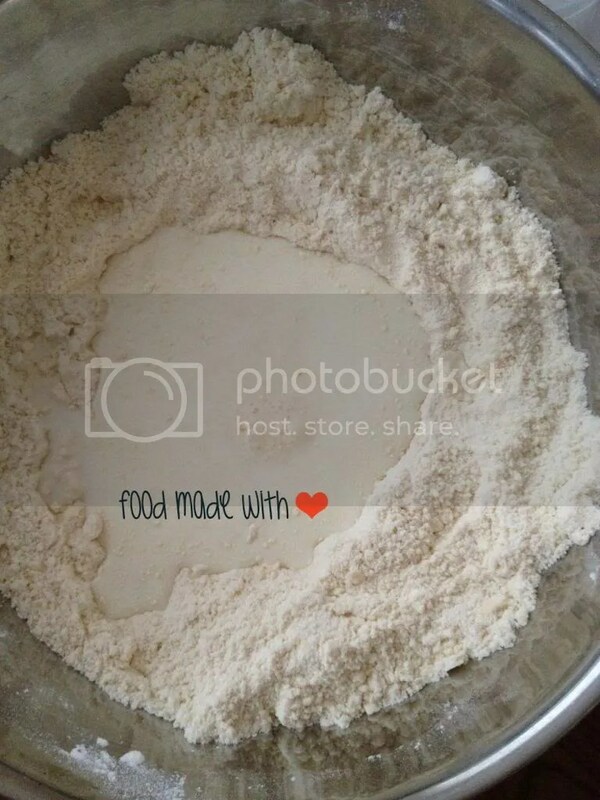 2) In a large bowl, place the self-raising flour and butter. Using your fingers, gently rub the butter into the flour till it resembles breadcrumbs. Create a well in the middle of the flour mixture and pour the milk and maple syrup into the well. Gently mix the dough till it all comes together. Add more milk (a tsp at a time) if the dough feels and looks a bit too dry. The dough should feel soft and a little sticky. 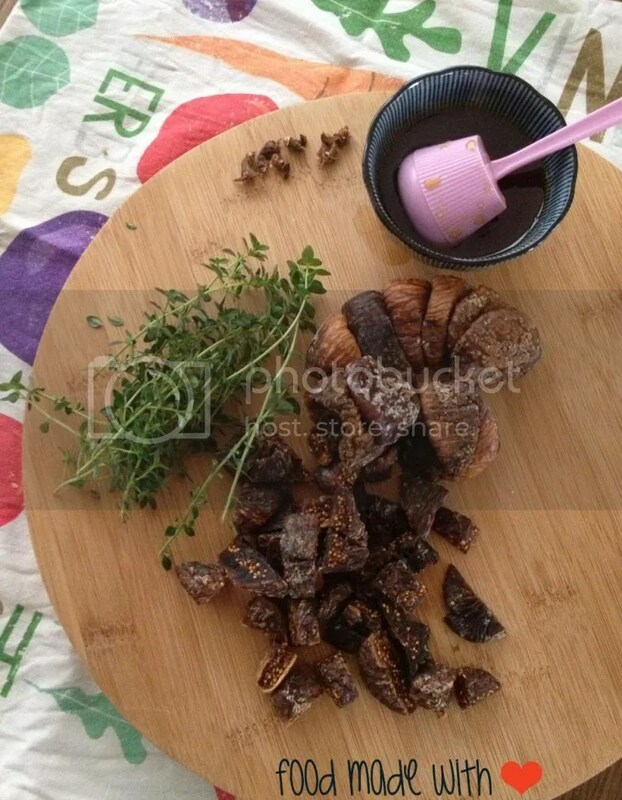 3) Fold in the figs and thyme leaves into the dough. Roll it out on a lightly floured surface and knead it slightly, careful not to overwork the dough. Using a rolling pin (or just your palms), flatten it out till it is about 3 cm thick. 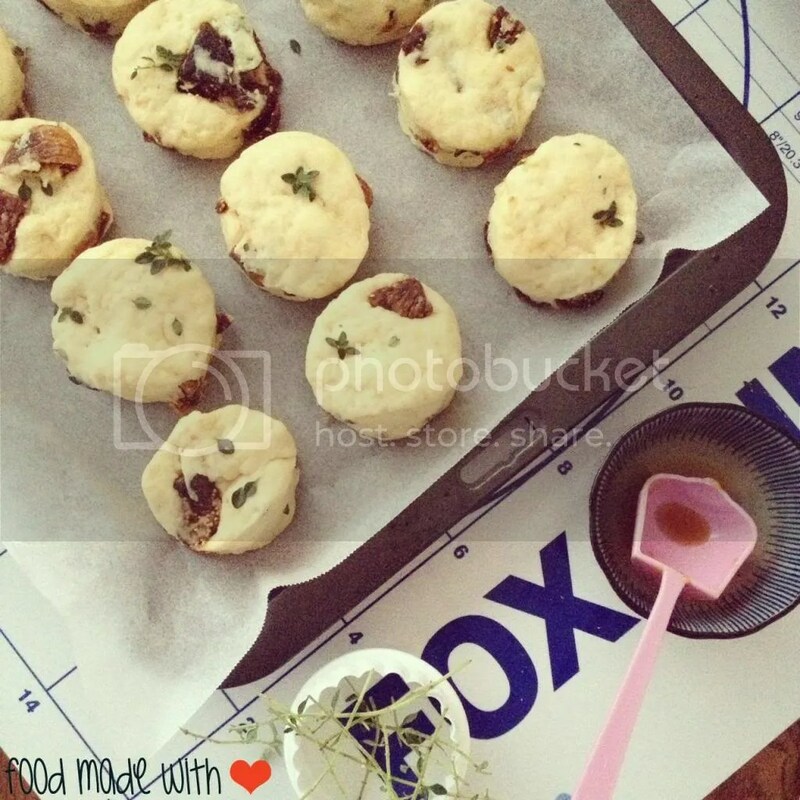 4) Using a scone cutter, cut out the scones and place them on the baking tray. Garnish the scones with more thyme leaves or sprigs of thyme if you’ve some. 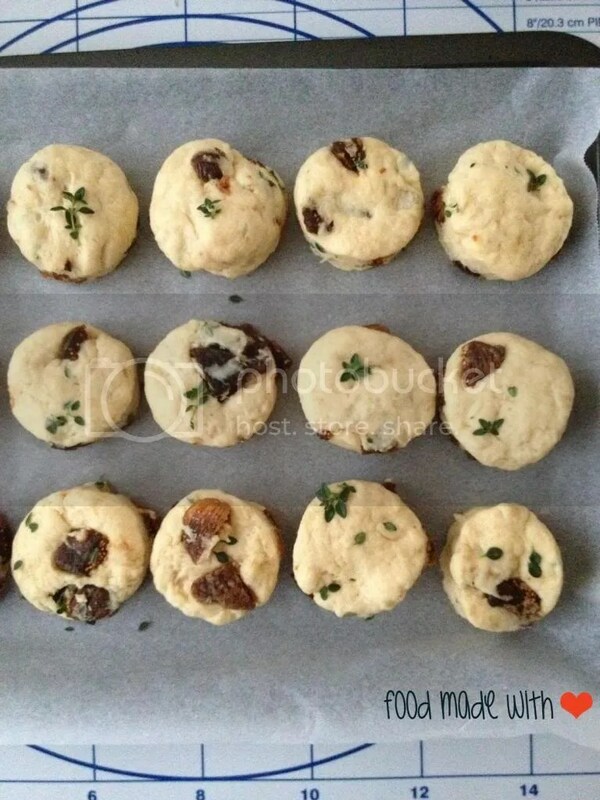 5) Bake the scones for 20-25 minutes. You can either leave it to cool and store in a air-tight container, or enjoy it hot with some butter, cream and jam. 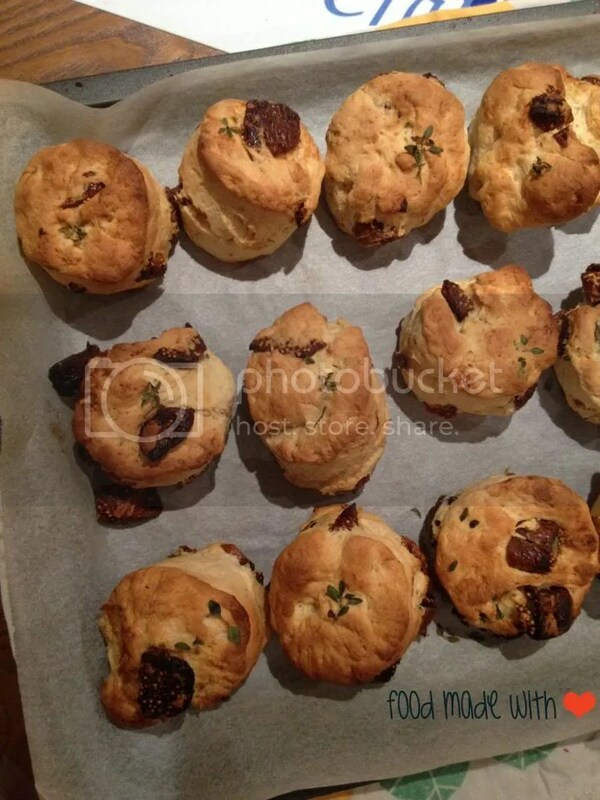 So dear readers, what is your favourite way of having your scones? Please share as I would love to hear from you! (: Have a great weekend and remember to always cook and bake with love! I personally love plain scones with cream and strawberry jam. funny enough i live not too far from mrs marples but never visit haha. I always smile when you post up new recipes. you are my true inspiration ❤ good job twinnie! Just love it. Ill try to make some at home. Thanks. No worries! (: Enjoy and let me know what u think! Hope you like it as much as I did! 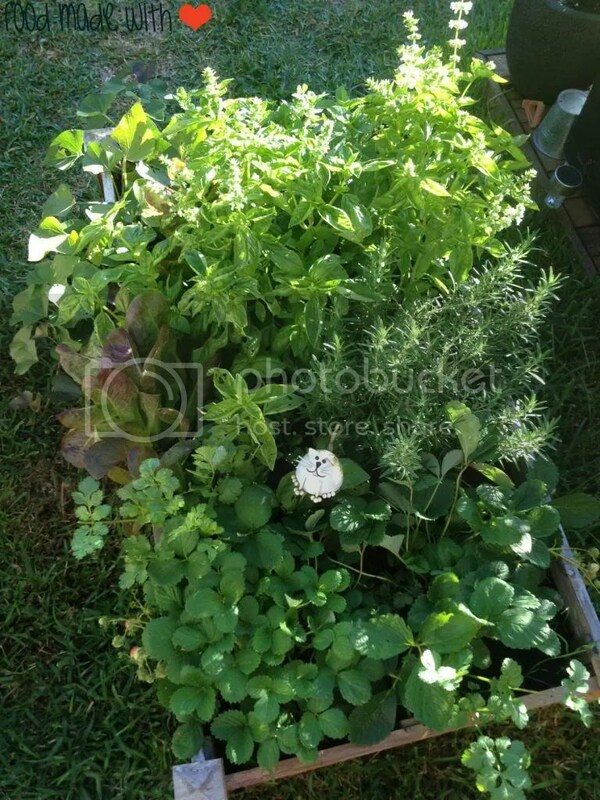 Loved Loved Loved your herb garden!!! I want one!!! !